Banana is a renowned super food that can propel your towards a slimmer person. Banana contains higher amounts of potassium, fewer calories and fat, but rich in fiber that is essential for weight loss. Other than boosting metabolism, banana smoothie boosts digestion while reducing the storage of fat in your body. Drink regularly to lose those extra pounds. Mangoes are an excellent source of vitamins A, B6 & C, folate and other essential nutrients and fiber to keep your body nourished and satisfied. Fiber is also low in calories and improves digestion, ensuring that calories are burnt effectively which helps in weight loss. Apart from lemon juice, mix all the above ingredients and blend. 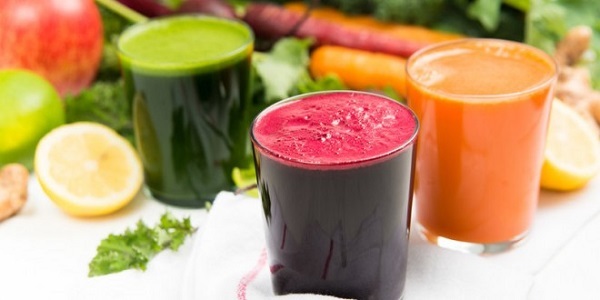 Drink 1-2 glasses of this wonderful smoothie at dinner. There are several fruits out there that help in weight loss by curbing appetite, boosting metabolism and reducing hunger. Regular consumption of such fruits comes with many health benefits that are also very useful for weight loss and boosting your immune system. Drink daily to boost your immune system and reap other health benefits. Weight loss benefits do not exclusively come from fruit smoothies. You can actually cut down your pounds by drinking green smoothie recipes at dinner. Green vegetables are loaded with nutrients and fat-burning compounds. In addition, they are low in fat and calorie content. Spicing them with fruits will give an added advantage to weight loss. Consuming smoothies at breakfast or dinner is one of the most effective methods to help in weight loss for people who are obese or overweight. You can prepare nutritious and delicious smoothies using ingredients from you kitchen cabinet to reduce your calorie intake and lose weight. Being obese or overweight puts you at an increased risk of several health issues like heart disease, joint pain, diabetes, and kidney problems among others. Luckily, you can prevent these conditions and lose weight with the help of the following 5 healthy smoothie recipes. Drinking smoothies at dinner can be effective in weight loss. They are easy to prepare, yet they come with many benefits, such as reducing appetite, improving metabolism, boosting the immune system and keeping you fuller for longer. Skip that late-night snack and grab a glass of smoothie to lose weight and improve your health! DURING THE INTERMITTENT FASTING, I WOULD LIKE TO SUBSTITUTE PROTEIN DRINKS/NUTRITIONAL SUPPLEMENTS FOR MY MEALS. HOW MANY PROTEIN DRINKS DO YOU RECOMMEND? If I make all the smoothies I'm drinking for the whole week on Sunday... do the vitamins lose their potency? Should I make the smoothie only on the day I'll be drinking it?